We were standing on the curb. Broad daylight. Sunny and warm. Oppressively warm. I should not have worn that jacket. She was standing beside me, with her left hand around my bent right arm. My phone buzzed, I reached into my jacket pocket, and pulled it out to see who was texting me. While distracted and looking at the phone, I stepped off the curb and walked five or six steps before I realized she had dropped my arm and stayed behind. As I turned to my left to see what she was doing, my sweeping gaze passed the fast-approaching yellow cab, headed directly toward me. I froze, looked back at the cab, now a few feet away, crunched my eyes closed, and braced for the immediate impact I knew was coming at about knee height. 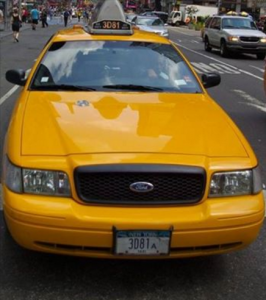 Behind my eyelids, I could still see the driver of the cab with his head down – texting? I knew he didn’t see me. Then, I felt a strong shove, from my right, which pushed me back toward the curb, out of the traffic lane. I stumbled, but did not fall. I opened my eyes, looked at my phone, surprised to see it still in my hand. I looked up for Cheryl. She wasn’t on the curb. I looked at the departing cab, now already across the intersection and a half-block down the street. I doubted whether the driver had looked up at all, had any idea he just missed ruining his day, and mine. I looked around farther to my left and found Cheryl standing in the middle of the traffic lane, looking at me. She smiled, casually walked back to me, took my arm, looked both ways for traffic, and we crossed the street. She shrugged, turned up the corners of her mouth into a small smirk, raised her eyebrows, and did not answer. And, I don’t usually swear. Thank you, Tammy Miskell and Janine Cherry, for your detailed editing. Thank you, Paramita Bhattacharjee of CreativeParamita, for the awesome cover design. Here’s the cover you helped me select. Thank you for your votes and suggestions. Paramita Bhattacharjee of CreativeParamita.com did the cover design.